We've updated the my.viewranger website with brand new Track pages, and also released ViewRanger V4.1 for Android which makes it a snap to tweet, facebook, and share your adventures right from within the ViewRanger app. ViewRanger’s ‘TripStories’ feature allows users to record GPS tracks of their outdoor experiences, whilst simultaneously creating a dialogue with geotagged photographs and tweets. The TripStory can then be shared with friends or fellow enthusiasts, who can also comment on the track. One of the new features in V4.1 for Android (Apple version to follow soon) is that users are now able to share their TripStory from within the app, on social media sites such as twitter and Facebook – bringing a new immediacy to the action. Some users had been piloting an early version of TripStories on the ViewRanger’s community site, my.viewranger.com. Their input has been used to create a redesigned track page, which focuses specifically on users sharing their adventure with friends and family. By linking their Flickr account to ViewRanger, users can attach photos to their route, creating an online, personalised album of their trip. 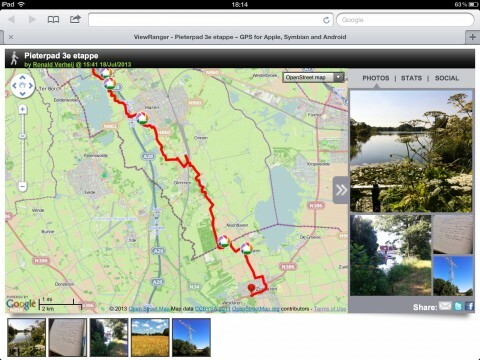 As well as a larger map to display the GPS track, the new page design highlights photos associated with a user’s TripStory. A ‘Lightbox’ allows photos to be scrolled through at a large size, to get a real sense of the sequence of events unfolding on the trip. The new features make creating, sharing, discovering and viewing TripStories a truly powerful feature of the ViewRanger app. 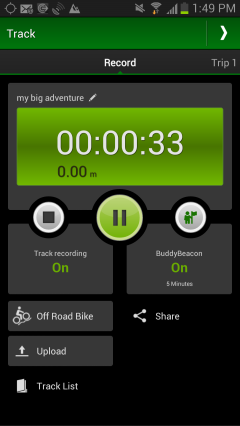 Share your track or BuddyBeacon from within the app onto social media sites such as Facebook and twitter, or via email. 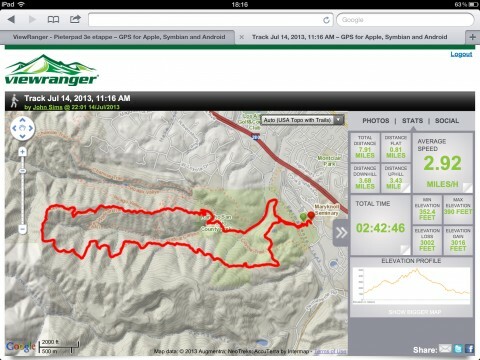 If a user clicks on a ViewRanger route, track or BuddyBeacon link, it will open in the ViewRanger app. When users share a link to their TripStory and the tweet is viewed, a preview map of the track and up to 3 pictures tagged to the track are displayed. In-app activity feed shows what favourite ViewRanger users are up to. .gpx files can now be shared via email, dropbox, and more. Option to keep the screen alight while the device is plugged into an external power source. TripStories are now displayed with a much larger map. Pictures associated with TripStories are more prominent on the website and can be scrolled through and liked via a Lightbox. New statistics show data on ascending and descending sections of a trip.